How would you like to become best buddies with one of the most magnificent animals on earth? 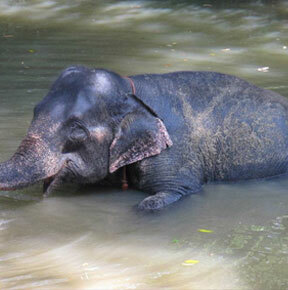 Volunteer in Sri Lanka in the Elephant Conservation project! The elephants are a wonderful animal – kind, caring and gentle. They have also been victims of abuse and their population continues to shrink daily. New Hope works with a local elephant conservation organization, which focuses on caring for elephants that have been rescued from pitiless situations such as working in the logging industry, exhaustion from domestication, and poor tourism practices. The elephant conservation project is always in need of able-bodied volunteers to provide the best care for these gentle giants, as well as help with the general operations of the conservation project, its tourism promotions and eco-farm maintenance. As a volunteer, you’ll play a big role in showering the elephants with the care and love that the gentle animals have been deprived of. Volunteers will also work with the local community to do other tasks such as gardening. Take part in this volunteer abroad program and do your part in protecting the natural wildlife and forest in this unique opportunity! Elephant Project: The daily maintenance and treatment of your assigned elephant, as well as assisting with the project’s administrative tasks, fundraising, researching resources and general maintenance necessary to assist the project’s many projects benefiting elephants and the lives of local people. Eco-farm: Volunteers will work in the eco-farm every day to help gardeners grow fresh and healthy fruits, vegetables and medicinal herbs. These products are used as a part of the enrichment program and are used as treats for the elephants as well as food for the onsite restaurant. Many of the ingredients used in volunteer meals will be consist of produce grown by the volunteers themselves. This is a great opportunity to learn about traditional farming methods and non-chemical fertilizers. Volunteers also have the opportunity to learn about fruits and vegetables native to Sri Lanka. In the future, the project hopes to provide poor farmers with elephant-dung fertilizer, which is a great way for farmers to non-chemically protect their crops and conserve the environment. Mobile Veterinary Unit (MVU): Volunteers are invited to help local veterinarians visit sick elephants and supervise religious parades. The MVU uses a vehicle to transport vets and medicine to elephants in need of care; the MVU may even travel hundreds of miles a day. The MVU efficiently treats elephants without having to set up multiple clinics through Sri Lanka and is capable of treating multiple animals at the same time. Veterinary care can be very expensive and elephant ownership can create a financial burden. For this reason, the MVU care is free so that more elephant owners will seek out medical assistance for their elephants before it is too late. This is a great way for volunteers to meet elephant owners and travel the country. English Teaching to Children: The project has organized local after school clubs to teach Sri Lankan children English. Strong English skills instantly open doors for Sri Lankan students, promising them a more prosperous future and greater job opportunities. Each after school club lesson is on Tuesday, Wednesday and Thursday for one hour and our volunteers run the lessons. Teachers do not need prior experience, just creativity and a positive attitude. Ages vary widely in the lessons, anywhere from young toddlers to late twenties. The project tries to make every lesson interactive and fun by incorporating interactive activities such as songs and games. In the future, they hope to open a learning center with computers, educational resources and a classroom-like environment. All four projects will be challenging, but very rewarding. You will have at least two days off a week to explore all Sri Lanka has to offer. You will be able to learn from locals and surround yourself in Sri Lanka’s beauty, both in its people and its nature. By volunteering in Sri Lanka in the Elephant Conservation project, you will be working alongside the Mahouts, or elephant caretakers to help care for elephants which have been victims of abuse. The project educates the volunteers on the plight of the animal and tries to bridge the barrier of human-animal communication. Volunteers who spend time caring and knowing the elephants go back and become ambassadors of elephant care and overall animal conservation. The elephants in turn also benefit from the work of volunteers, as they receive much more attention, and through the steady stream of funds the project receives from volunteers it work improve facilities and habitat. This project is a rare and amazing opportunity for hands-on experiences with elephants while enjoying the natural beauty and culture of Sri Lanka. If you’re seeking a career in animal welfare or veterinary, this would be a great first step! There are no specific qualifications needed to volunteer with the elephant conservation project in Sri Lanka. However, your understanding of the Sri Lankan culture and language can help to improve your experience. We recommend enrolling in our one-week Language & Cultural Immersion program. Volunteers should have a deep love for animals, a hard-working attitude and a respect for the local staff and community members. Please note that this project requires volunteers to spend much of their time outdoors. This location program is located in Kegalle, approximately 85km from Colombo. The project is situated in a lush 15 acre sanctuary. Since the beginning, the sanctuary has provided care to over 60 elephants. During your free time, you can visit ancient historical cities like Anuradhapua, the first capital city of Sri Lanka, and Polonnaruwa, where you can explore the ancient ruins of the temples built by the ancient Kings. You can hike to "SIGIRIYA ROCK" and witness spectacular scenery from there. You can also visit North East of Sri Lanka and visit famous beaches like Arugam Bay beach and monasteries, temples, parks, churches, museums, art galleries, etc.